There are days when sun-drenched sounds nice and hydrating, but extra hours in the heat usually leaves me dry and needing more moisture. But the last thing I want is a cream that feels like a heavy blanket. Need vs. want. A common conundrum. KIO KIO New Zealand combines the needs with the wants quite well, I&apos;ve found. This natural range of bodycare products has a luxuriously scented moisturizer that has a lightweight formula for heavyweight moisture--perfect for when your skin needs hydration but you don&apos;t want a layer of greasy cream. It uses plant-based bioactives and rare wild harvested botanical native extracts from New Zealand&apos;? ?s virgin forests. The big difference is the mineral-rich water. This is hardly your typical H2O. It&apos;s filtered from mountain ranges through a pristine valley of volcanic stone, producing one of the highest levels of colloidal silica in any natural spring water in the world. Your skin craves just a sip of this rich drink, since research has shown that silica is beneficial in building collagen. This super soft water is also one of the softest naturally occurring water, with a hardness rating of just 12. Which translates to super soft skin. Because we&apos;? ?ve all seen what hard water does to hair and skin. Not pretty. I love the Rainforest & Koromiko (it&apos;? ?s for renewing stressed skin). But you can pick and choose based on your skin&apos;? ?s needs &apos;?? the sweet lemon healing oils of the Citrus Petal & Tarata, the naturally nurturing Pacific Tiare & Ti Kauka (also known for good luck and fertility), or the Frangipani & Puriri for natural balance. 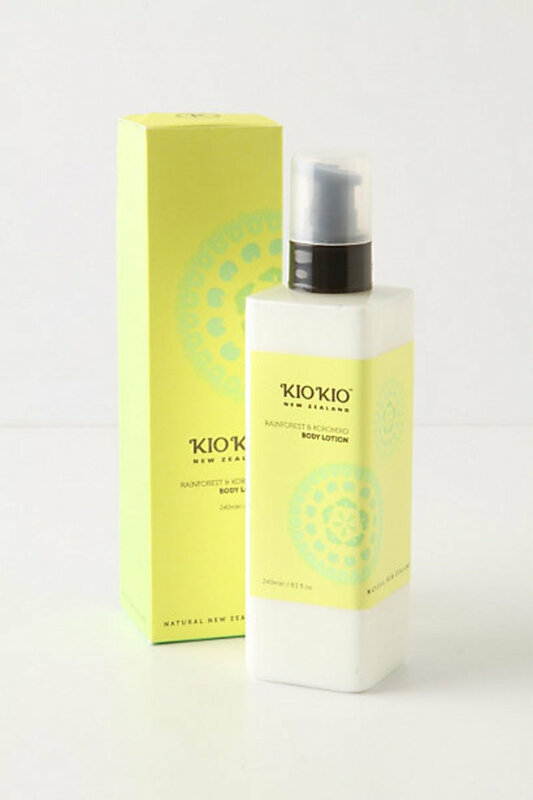 Kio Kio New Zealand also offers an entire line of skincare products, including soap, body cream, body mist and body wash. The body lotion is available at anthropologie.com for $35. Cheryl Fenton is a Boston-based freelance writer, who writes beauty, fashion and fitness for Boston Common, Stuff and Glamour magazines, as well as her own EasyPeasyBlog.com. Momtrends was not paid for this post. We did get samples.